Hello friends...well I did it..
on Main Street and thousands of potential customers will be walking past my window. I signed my lease and picked up the keys. I was shocked at how easy it was to write that big rent/deposit check. Still in a happy fog I guess! This space is perfect in every way. 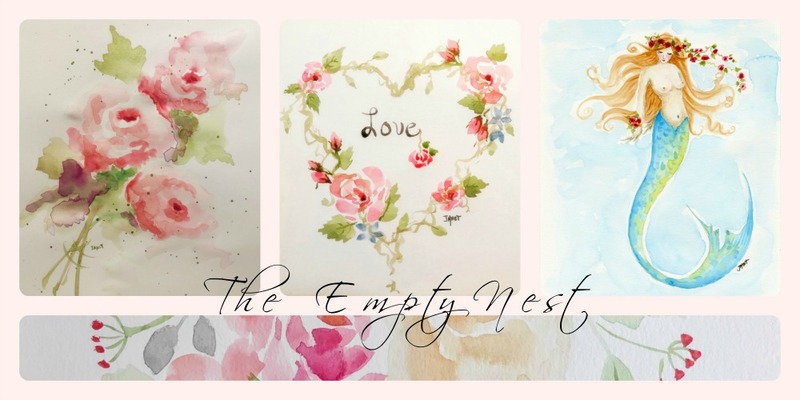 I have 1,600 sq ft to set up my CHALK PAINT™ workshops and hopefully add on some easy project sewing workshops also. There is a huge bathroom at the rear of the shop with double doors at all entries. I love that it will wheelchair friendly. This brick building was once the original hardware store here in Old Town Warrenton. The new owner very carefully has renovated the building. These are the original wood floors and beautiful punched tin ceiling tiles. The walls are already crisp white. The french doors you see lead to the huge display window. The double doors you see are the front entrance to Main Street. Great visibility and PERFECT location!! These doors lead to the front window...love that all doors are double wide. This will make moving large pieces of furniture so easy. Decorating ideas are spinning in my little head so quickly!!!! I have been thinking of fun ideas to fill up all the wall space and found this photo. I could have them running up both sides of the walls! wouldn't that be beautiful and showcase Annie's paints. Now I just need the doors...anyone have any unwanted doors??? 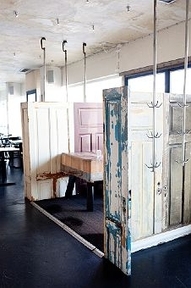 I love this use of old doors also...hmmmmm. I hope to have a Grand Opening in late June/early July. decorative paints and supplies until the very end. 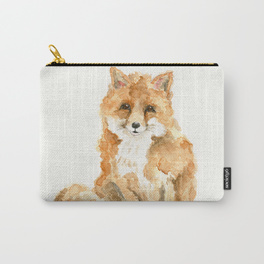 So until I announce otherwise, you can find all your painting goodies in my Fox Den booth. very soon and also setting up a few workshops..beginner and advanced. Check back here for dates on the workshops. Email me if you are interested in Sunday workshops! You can paint while Hubby mows the lawn. Until next time...be kind and stay creative! Congratulations! Can't wait to see how you transform this incredible space. Congratulations, Janet! How exciting! What a fabulous space. The potential here is unlimited. I can't wait to see how you set things up. Soooo exciting for you! Wishing you all the luck in the world with this new venture. The suite is awesome with those fabulous hardwood floors and the light flowing throughout the space.... Really awesome! Janet, YOur space is so impressive! It has everything in perfect order and color and condition~LOVE the ceiling tiles and you won't have to do any prep work on the bones~just your displays! I adore all the windows and the french doors, its totally dreamy!! Congratulations Janet! This sounds like another exciting new chapter for you. I'm sure you'll be a huge success. Your place is gorgeous. OMGosh Janet!!! I am so happy and excited for you! The space is absolutely gorgeous with those floors and ceiling. And looks like lots of light too. I know you're going to love this and I can't wait to read all about it!! Wow, I am so excited for you! I have always dreamed of having and antiques/floral shop and I just can't imagine how wonderful you must feel today knowing your dreams are coming true! Hooray, for you! Congratulations, Janet! this is so exciting!! I think a road trip is called for when you have your grand opening. I'm going to put the word out to some of my peeps and we can caravan over to Warrenton for the big reveal. So happy for you! Janet this is the perfect place. The ceiling are beautiful. OMG and a show room window! It is so big, you will have so much fun decorating it. can't wait to see it..your dream has come true! You have your own shop that has room to teach.prefect. Congratulations Janet! How exciting. I'll be back in town around your opening so I will see you in your new store. Squeee! I am so excited for y ou Janet! Remember when you were nervous to take the step of getting your booth space? Lol, you rocked it, just like you'll rock this shop. The place is gorgeous! You're one lady who never does things by halves Janet.....Congratulations, this is very exciting news indeedy and yes I do love that ceiling....what a lovely touch. Can't wait to see how this space develops and of course I wish you all the very best , i know it's going to be something very special. Congratulations, Janet. How wonderful to be doing something you so love! How perfect is that??? I can't wait to see her all spiffed up and what you do with this wonderful space. Amy over at Maison Decor is doing the same thing and I am avidly following her every move, too. What a great thing! Congratulations. CONGRATULATIONS!!! So very, very exciting!!! Janet, I'm so darn excited for you! I just wish I lived nearby! I just saw a really cool booth today with doors, some of them needed to be free standing and all they did was add shelf brackets, like the metal kind, 2 on each side, totally put that in my brain for if ever.... Best of luck to you, can't wait to follow the journey! Congratulations, Janet! So excited for you...can't wait to see how you transform this space! Good Luck! Congrats on the new "open door"! I can imagine all the thoughts and ideas buzzing in your head keeping you up at night. There's nothing like a fresh, clean canvas. Good luck with the new setup! I am SO thrilled for you and for Warrenton! What fabulous space--of course I know just where it is...I can't wait, wait for you to open. the Magnolia Lane girls will be there at first chance to celebrate a wonderful new venue in Old Town. Hooray!!! For all kinds of doors in all conditions at super low prices, go to any Habitat for Humanity ReStore. It's a treasure trove of that king of thing. Go to fauquierhabitat.org . Apparently, a Restore is coming soon to Warrenton, but they're everywhere else, e.g. Leesburg, Purcellville, etc., and online. Congratulations, Janet....I'm very excited for you!! I so wish I was closer so I could take a ASCP workshop from you (love the paint but struggle with waxing!!). Sending my best wishes in your new venture! Blessings! Wonderful, wonderful space! Congratulations and the best of luck to you at Sweet 102. Oh. My. Gosh. YOU ARE REALLY DOING IT! I'm so proud of you! Your place is the most gorgeous space I've ever seen - it looks like a gallery! The light, the floors, the space! We have a place called Construction Junction here that collects construction salvage and they have rows and rows of doors cheap. You should look for something like that. Oh, and I thought of you last night! 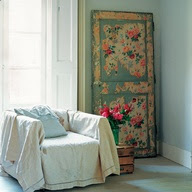 My neighbor had a decorative room divider panted like that door and hung it on the wall. It looked amazing! What a beautiful space! I'm so happy for you Janet--I know you'll do great! Congratulations!! That is so awesome and the space looks gorgeous! I agree I am excited to see how you will set things up. Again congratulations on this awesome venture. Congratulations, that is so exciting! You chose a great space, I love the natural light and the wood floors! This is just wonderful news to read!!! I'm so glad for you! It's just amazing how and where your God given talent has taken you!! Wishing you the very best...and look forward to so much more of your adventures! You truly are an inspiration!!! Congratulations the space is Gorgeous! I love your ideas and I would love to get my hands on one of those doors to paint! How exciting, and what a fantastic space! I can't wait to see what you do with it. Never miss a post..Follow by Email Simply add your email address below. Thank you! Welcome..I'm Janet. I am a mostly self taught artist who is happy to spend my days in my little home studio. 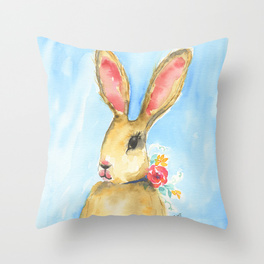 I dabble in watercolor, oils and acrylics, to create whimsical florals and folk art. My motto is "Just go for it!" After all, we are here on this planet for only one lifetime. Don't let fear or self doubt keep you from getting the most out of it. Click on this link and follow me on Instagram...see you there! Demystifying The Auction Process...With Cheffins Auction House, Cambridge!